She has a voice from the land of the Cedar, deep, velvety, and made of a grain as soft as an embrace. A Francoise Hardy, but carried by the winds of the Mediterranean. When the great composer and producer, Gabriel Yared, composer of film scores such as “The English Patient,” “Cold Mountain,” and “Just the End of the World” (among many others) met Yara in Paris in 2012, he was seduced by her unique vocal timbre. What could he do with this diamond in the rough? How could she be transformed and shaped? 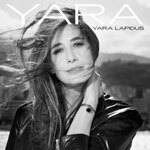 Yara Lapidus, like Yared, is of Lebanese origin. These two were ‘found’. They are both exiles from their land, and have great nostalgia of a beautiful country bruised by war. Their friendship has its source in the mountains of Mount Lebanon. They are both born in Beirut. Yared was the producer of Michel Jonasz, and of Françoise Hardy, to name just two giants of French Chanson. Yara had already lived several lives. Having trained as a stylist at one of the leading fashion schools in Paris, she worked for Lapidus, then for Balmain where she was the assistant to Oscar de la Renta. She launched her own label, whose flagship model was a series of jeans, customized with Ming embroidery, inspired by a trip to China. During this period, she drove back and forth through Paris behind the wheel of a truck, delivering her creations herself to chic boutiques. And then? She falls in love with Olivier Lapidus, continuing her work as a designer and a wife alongside the great couturier. Parallel to this, the eclectic Yara takes acting classes at Florent, Pygmalion and then the Actor’s Studio. She does some soul-searching. Actress or fashion artist? She realizes that she is versatile, and that fate could have led her to the silver screen. In the fashion building of Lapidus, where she works, are the headquarters of Art Media, the agency that represents all the stars of French cinema. One day, Yara bumps into Dominique Besnehard, Catherine Deneuve and Sophie Marceau’s agent. Captivated by her resemblance to Monica Bellucci, he immediately offers to recruit Yara and launch her career. She refuses politely. He insists. In vain. The young woman has other projects and desires like a starting a family, and she will have two daughters with Olivier Lapidus. But a dream eats away at her she has always wanted to sing, to put into music the words she writes and that accumulate in her little notebooks. She strums on her guitar during her lost moments, and also plays the piano, which she learned since her earliest childhood. Singing? Perhaps a crazy idea when you’re not 20 years old anymore? It’s impossible to put her dreams to sleep, and the countless poems that tell so much about herself. Love, of course, and nostalgia too. Yara acts right away : she releases an album in 2009, simply called “Yara.” Then, while preparing another and presenting some titles to Gabriel Yared, whom she met in Beirut a few years earlier, he says, “You’re too drowned in the instruments!”. Unsurprising, given he is a perfectionist. Yared wants to lift this voice into the clouds, in the most beautiful way possible. To surround it with aerial sounds, so that the ‘grain of Yara yields the best fruit’. So, Yared finds his songwriting pen again, as he had neglected it a little in order to write music for film. He launches into an ambitious production. A crazy project. Yara embarks on a musical journey, where she is both the starting point and the destination. Two years of writing, followed by recording sessions at the legendary Abbey Road Studios, London. Approximately 40 musicians are contracted. Yared writes music for his little ‘Lebanese sister,’ obsessed with words. He also includes a theme composed for the cult film “37°2 le matin” (Betty Blue), released 30 years earlier and which achieved worldwide success at the time. Yara adds her words. The result: a hypnotic track, “Encor, Encor,” in which the great Yared comes forward, singing a charming duet with Yara. Throughout this creative adventure, Yara gives us crafted lyrics, a touching sincerity in which melancholy is that of a lost paradise: obsessive love, impassioned love, or tumultuous happiness; all of this, but with a bitter taste is its signature. Yared, with the meticulousness of a watchmaker, never finishes finessing the arrangements. Two years lead to the album “Indéfiniment,” an enigmatic word. There is nothing indefinite about this production, but there is the meticulous and magical precision of a craftsman of music and sound, combined with a voice, like a siren, burying its roots somewhere on the coast of Tyr, a small Lebanese fishing port, crossed by the misfortunes of the time. This is where Yara spent her childhood. Yared, the Pygmalion, did not fail in his role as an alchemist: the CD is a pure jewel. No more is Yara’s haunting voice overwhelmed by sound. It is just sparkling and magical.